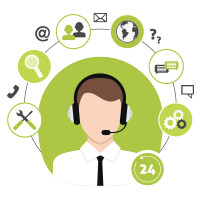 CenturyLink needed to complete a successful migration of its marketing automation platform to improve efficiency and cut the costs of managing disparate, legacy marketing platforms. 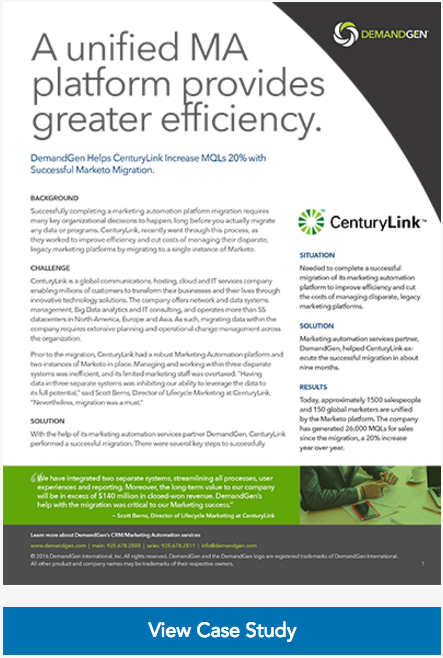 Prior to the migration, CenturyLink had a robust Marketing Automation platform and two instances of Marketo in place. Managing and working within three disparate systems was inefficient, and its limited marketing staff was overtaxed. Today, approximately 1,500 salespeople and 150 global marketers are unified by the Marketo platform. The company has generated 26,000 MQLs for sales since the migration, a 20% increase year over year. CenturyLink has more than $4 million in monthly recurring revenue closed for the year, a 96% increase year over year. In addition, CenturyLink was a recipient of this year’s Revvie Award at the 2016 Marketing Nation Summit in Las Vegas, NV. With more than 6,000 registered marketers from around the globe, this year’s Summit focused on inspiring “Tomorrow’s Marketer” and features thought leadership, educational sessions, workshops, and trainings that empower marketers of every level to succeed in today’s digital era. 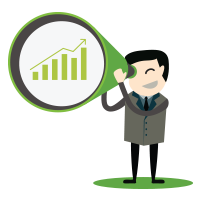 For more information on how DemandGen can become your team’s partner and help you with your migration, contact us! If you would like to see more examples of how we’ve helped other clients check out our case studies!